Having a little fun with Oprah...perhaps she'll consider it next year! and I can solidly say, it's been a year I don't ever want to forget...it's going down in this girl's personal history book!
. Now I understand the importance of appreciating an author's efforts, and likewise, valuing the thoughts of readers--keep the reviews coming. Huge votes of confidence came from readers and the book industry when the novel received the 2015 Christian Small Publishers Book of the Year Award for Historical Fiction and the 2015 Inspirational Readers Choice Award - Women's Fiction, 2nd Place. Also, the kind and encouraging words in emails, letters, and casual conversations continue to provide momentum for me to write in what can seem a rather secluded and ambiguous career. When I pop my head up from my computer, look around, and wonder, "Hey, is anyone going to want to read this? "...those motivating words are what push me on to the next scene and the momentous task of completing my next manuscript. are golden. The insights, connections, questions, and genuine love shared with these women have been the unexpected bounty of the year's journey. These experiences, I will treasure forever. a home and believing in me. , were the masterminds behind getting the book in front of so many readers, bookstores, and blogs supporting authors and avid readers. They held my hand through the jungle of tweets, posts, shares, links...and admittedly, still do! I must say, speaking at the Tattered Cover about my debut novel was a highlight. Even though there weren't long lines waiting for me to sign or a scramble for tickets to attend my talk, it was the complete respect and regard the staff and audience shared with me as an author who simply loves to express with words. They get it...despite my absence on the NY Times Best Seller List. Also, hats off to local favorites, The Bookies, Compleat Lifestyles, WISH, Brushstrokes Gallery (specifically cover artist of the novel, Kelly Berger),and The Lark, for providing precious shelf space and opportunities to sign books at your stores. The Douglas County Library System and the Poudre River Public Library District endlessly support local authors and highlight Colorado talent. The folks at The Lark know how to display a book! from its inception, and throughout its debut year. And finally, my own peeps at my long-time Piggy Toes Art Studio, close family, and friends--mille fois merci for believing and supporting my creative spirit to always take flight! Here's to continuing the journey! Get in touch if you'd like me to visit your book club, store, library, other speaking event, or if you simply want to chat. 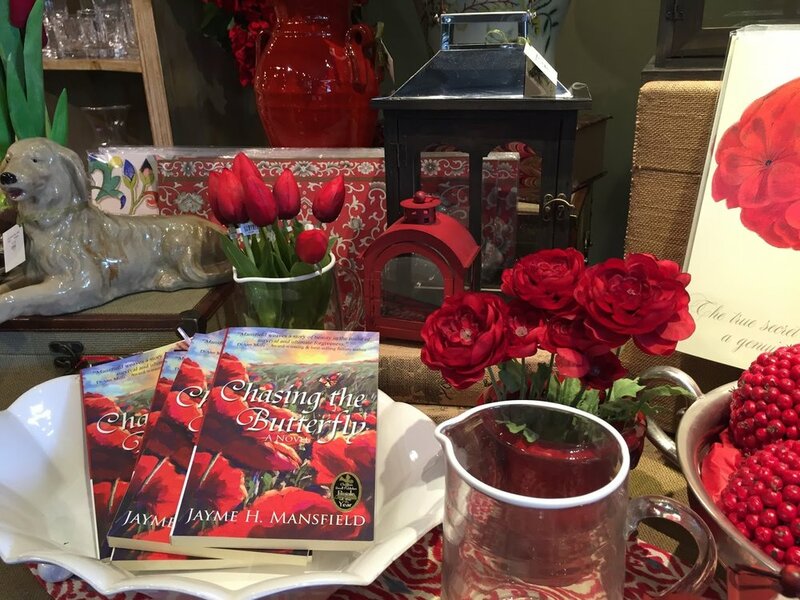 You can find me at jayme.mansfield@me.com, respond to this blog, or message me on Facebook! is due out in the next few months. I'll be posting some fun things and giveaways on FB and Twitter throughout the rest of the anniversary month, so be sure to watch! Truly, I am grateful and humbled...blessed you have shared in the journey and taken flight with me.